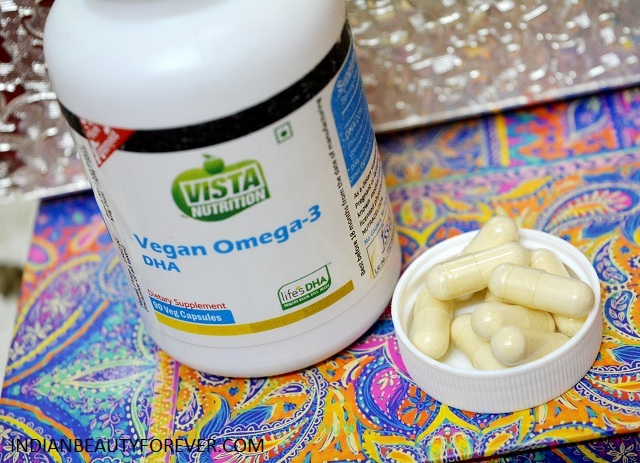 I have another supplement brand to share with you and this is Vista Nutrition. Supplements can be very beneficial for people who are mostly on the go and really busy. The deficiency of certain vitamins and minerals may arises when proper diet is not taken which is mostly use to busy schedule these days. One such vital substance is Omega 3 fatty acids. Omega 3 fatty acids are rich in walnuts, salmon, flax seeds etc. They are essential in keeping the heart and additionally also keeps the skin and hair in good state whether you intake omega 3 fatty acids for skin, hair or overall health, it is important that you take it. Even for pregnant women Omega 3 fatty acids and DHA are beneficial. People who do not eat fish will rely on the vegan source of omega 3 fatty acids. 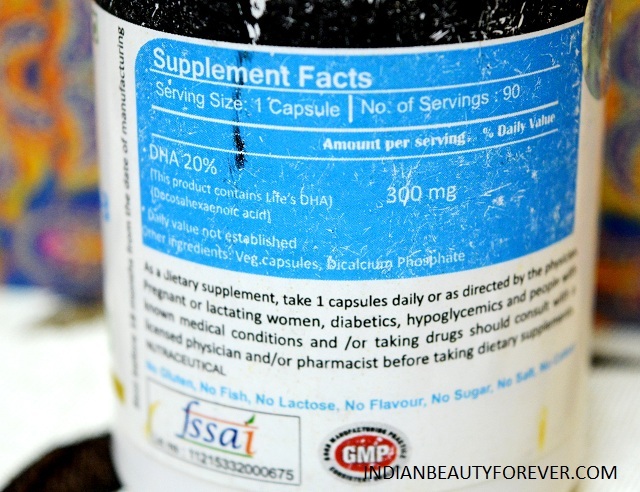 Price: These capsules are for 1093 rupees for 90 capsules. About the product: One of the biggest challenges for the vegan and vegetarian diet is getting a proper balance of healthy fats. With our contemporary, industrialized diet, it’s easy to become deficient in essential fatty acids (EFA), derived from healthy Omega 3 fats. Other Ingredients: Vegetarian Gelatine, Magnesium stearate. These capsules are to be taken one capsule along with the meal or directed by the physician. Omega 3 fatty acids are good hence I take then every day since I do not eat fish and hardly eat dry fruits like walnuts etc except for cashew nuts. 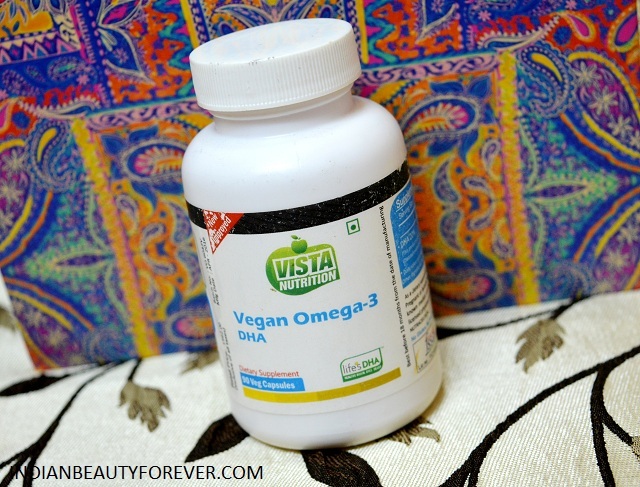 Hence for people like me such capsules are ideal and safe to get the recommended amount of Omega 3 fatty acids. Product sent by the brand. 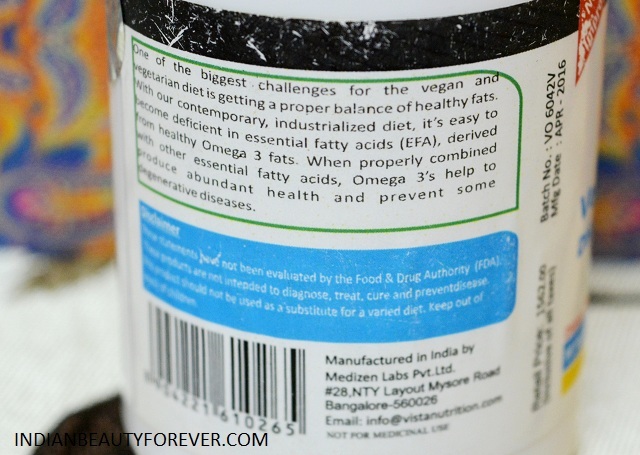 Where is the DHA in your product derived from?